There are people around me who encounter me in certain situations that call me a perfectionist. I am not, and I will not claim the title. I am not a “type A” personality or a “control freak”. I am particular and I like things to be right if at all possible. There are few things I agree with that I was taught in the Southern Baptist Church, but I do agree with this- I am not perfect. I understand the limitations of situations, of being human, and I have many weaknesses- like not asking for help. But something about control became magnified and caused an epiphany for me when I was trying to get pregnant with my first child. There are things I have control over, and things I very much do not. What happened in the heightened situation of hormones was that I made a decision to control the things I could and let the things I cannot control go. 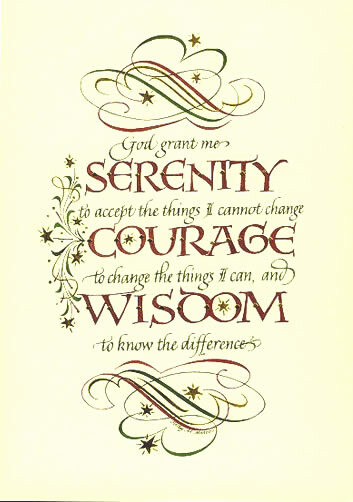 This is not unlike the serenity prayer prayed in AA, NA, OA, etc. every hour of every day. But… I do take the courage part very seriously. I feel that we focus a lot on granting the serenity to accept the things we cannot change, but we forget the courage to change the things we can. This is hard, harder sometimes than letting go of control is taking it. On the mornings that I walk my daughter to school I am consistently impressed by the teacher that is in charge of the cross walk. She taps on windows of parents that parked in the wrong place, politely but with authority asks for parents to use the cross walk as a good example for the children. As I walked away the other day I wondered if the school specifically picked teachers with personalities that were naturally confronting. But you don’t have to be, you do however need to have a confidence and courage that you are in the right and (in her case) protecting the safety of all those involved, especially the children. I do not have a naturally confronting nature, confrontation is something I worked very, very hard to be comfortable with- it comes with the “everybody-needs-to-like-me syndrome”. Now I push when need be and pull back when I can. Sometimes it is only in retrospect when I understand the difference (the wisdom to know…). I do, however, as my best friend Melissa says- “Want things the way that I want them.” If you know me, you will see the difference between “type A perfectionism” and wanting things done well. I am able to let things go that cannot be controlled and I could care less if there is a typo in the bulletin, but when it comes to relaying information, we should tell the truth, especially when we have access to it. There are so many things that are a “matter of opinion” but there are some that are not. I believed this is why I loved music as much as I did, there are controlled rules- a quarter note = 1 beat, crescendo, decrescendo, ritardando- these were all directions, but there was also room for interpretation. The composer told me what note to play or sing and I played or sang that note, and I got louder and softer/faster and slower as the music told me to. That was the control the composer had over the music, but the interpretation was up to the player or singer or conductor. A composer dead 300 years has no say in the interpretation. Serenity and courage, not perfection. May we all today dare to have the courage to stand up for what is right, and to let go of the need to control the uncontrollable. This entry was posted in Ministry, Worship and tagged confrontation, control, music, perfection, perfectionist, pregnancy, school, type A. Bookmark the permalink.